The Indian rupee sign (sign: ₹; code: INR) is the currency symbol for the Indian rupee, the official currency of India. Designed by Udaya Kumar, it was presented to the public by the Government of India on 15 July 2010,  following its selection through an "open" competition among Indian residents. Before its adoption, the most commonly used symbols for the rupee were Rs, Re or, in texts in Indian languages, an appropriate abbreviation in the language used. The Indian rupee is the official currency of India. The rupee is subdivided into 100 paise, though as of 2018, coins of denomination of 50 paise or half rupee is the lowest value in use. The issuance of the currency is controlled by the Reserve Bank of India. The Reserve Bank manages currency in India and derives its role in currency management on the basis of the Reserve Bank of India Act, 1934. The r rotunda (ꝛ), "rounded r", is a historical calligraphic variant of the minuscule (lowercase) letter Latin r used in full script-like typefaces, especially blackletters. The Unicode character for the Indian rupee sign is U+20B9₹INDIAN RUPEE SIGN. Other countries that use a rupee, such as Sri Lanka, Pakistan and Nepal, still use the generic U+20A8₨RUPEE SIGN character. The Pakistani Rupee (Urdu: روپیہ‎ / ALA-LC: Rūpiyah; sign: ₨; code: PKR; is the official currency of Pakistan. The issuance of the currency is controlled by the State Bank of Pakistan, the central bank of the country. The most commonly used symbol for the rupee is Rs, used on receipts when purchasing goods and services. The Nepalese Rupee is the official currency of the Federal Democratic Republic of Nepal. The Nepalese rupee is subdivided into 100 paisa. The issuance of the currency is controlled by the Nepal Rastra Bank, the central bank of Nepal. The Nepalese rupee was introduced in 1932, when it replaced the Nepalese mohar at the rate 2:1. The Union budget of India for 2010–11 was presented by Finance minister Pranab Mukherjee in the Lok Sabha on Friday, February 26, 2010. Udaya Kumar Dharmalingam born 10 October 1978 in Kallakurichi, Tamil Nadu is the designer of the Indian rupee sign. His design was selected from among five short listed symbols. According to Udaya Kumar the design is based on the Indian tricolour. Devanagari, also called Nagari, is a left-to-right abugida (alphasyllabary), based on the ancient Brāhmī script, used in the Indian subcontinent. It was developed in ancient India from the 1st to the 4th century CE, and was in regular use by the 7th century CE. 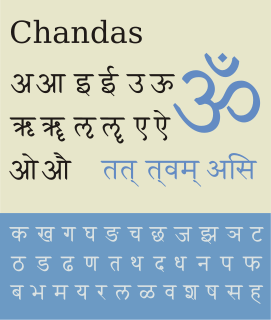 The Devanagari script, composed of 47 primary characters including 14 vowels and 33 consonants, is one of the most adopted writing systems in the world, being used for over 120 languages. The ancient Nagari script for Sanskrit had two additional consonantal characters. The National Flag of India is a horizontal rectangular tricolour of India saffron, white and India green; with the Ashoka Chakra, a 24-spoke wheel, in navy blue at its centre. It was adopted in its present form during a meeting of the Constituent Assembly held on 22 July 1947, and it became the official flag of the Dominion of India on 15 August 1947. The flag was subsequently retained as that of the Republic of India. 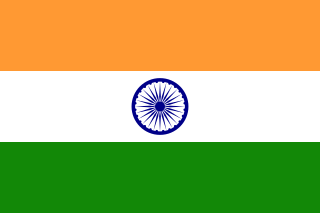 In India, the term "tricolour" almost always refers to the Indian national flag. The flag is based on the Swaraj flag, a flag of the Indian National Congress designed by Pingali Venkayya. The Bachelor of Architecture (B.Arch.) is a bachelor's degree designed to satisfy the academic requirement of practicing architecture. Ubuntu became the first operating system to support the Indian rupee symbol by default. Since its 10.10 version it has supported the symbol out of the box,  as it was added to the Ubuntu font family by a contributor. Since then, it has been included in various GNU/Linux distributions. On 18 May 2011, Microsoft released an update KB2496898 to Windows Vista, Windows Server 2008, Windows 7 and Windows Server 2008 R2 operating systems to include support for this new Indian rupee symbol. With the Windows update, it is now possible to use alt code text entry to obtain the Indian Rupee symbol – Alt+8377. On systems running Windows 8, the symbol can be typed using the English (India) keyboard layout with the key combination Alt Gr+4. Apple Inc. has added support for the rupee symbol with iOS 7. Mac OS X Lion (10.7) also includes the new Indian rupee symbol and can be found in the Character Viewer. As of Mac OS X Mountain Lion (10.8), users using the Devanagari keyboard can enter the new Indian rupee symbol by typing ⌥ Option-4 (a combination that yields the Cent symbol on a US keyboard layout). Rupee is the common name for the currencies of India, Pakistan, Indonesia, the Maldives, Mauritius, Nepal, Seychelles, and Sri Lanka, and of former currencies of Afghanistan, Tibet, Burma, British East Africa, German East Africa, the Trucial States, and all Gulf Arab Countries. 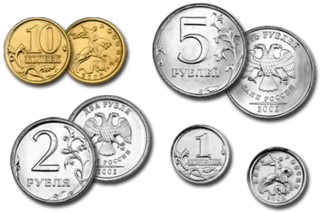 The Russian ruble or rouble is the currency of the Russian Federation, the two partially recognised republics of Abkhazia and South Ossetia and the two unrecognised republics of Donetsk and Luhansk. The ruble is subdivided into 100 kopeks. The manat is the currency of Azerbaijan. It is subdivided into 100 qəpik. Coins of the Indian rupee were first minted in 1950. New coins have been produced annually since then and they make up a valuable aspect of the Indian currency system. Today, circulating coins exist in denominations of ₹1, ₹2, ₹5, and ₹10. All of these are produced by four mints located across India, in Kolkata, Mumbai, Hyderabad and Noida. The Gandhi Series of banknotes are issued by the Reserve Bank of India (RBI) as the legal tender of Indian rupee. As the name suggests, the series is so called because the obverse of the banknotes prominently display the portrait of Mahatma Gandhi. Since its introduction in 1996, this series replaced all Lion Capital Series banknotes issued before 1996. The Reserve Bank of India (RBI) introduced the series in 1996 with 10 and 500 rupee banknotes. The Indian 1000-rupee banknote was a denomination of the Indian rupee. It was first introduced by the Reserve Bank of India in 1938 under British rule and subsequently demonetized in 1946. Post-independence, the denomination was re-introduced in 1954. In January 1978, all high-denomination banknotes of ₹1000, ₹5,000, and ₹10,000 were demonetized in order to curb unaccounted cash money. The Indian 500-rupee banknote is a denomination of the Indian rupee. The current ₹500 banknote, in circulation since 10 November 2016, is a part of the Mahatma Gandhi New Series. The previous banknotes of the Mahatma Gandhi Series, in circulation between October 1997 and November 2016, were demonetised on November 8, 2016. The Indian 100-rupee banknote is a denomination of the Indian rupee. It has been in continuous production since Reserve Bank of India took over the functions of the controller of currency in India in 1935. The present ₹100 banknote in circulation is a part of the Mahatma Gandhi Series. These notes are in circulation along with the Mahatma Gandhi New Series of banknotes which were introduced in July 2018. The is a denomination of the Indian rupee. The present ₹50 banknote in circulation is a part of the Mahatma Gandhi New Series of banknotes.However, ₹50 banknotes of the previous series( Mahatma Gandhi Series) will continue to be legal tender. The Indian 20-rupee banknote is a common denomination of the Indian rupee. The current ₹20 banknote in circulation is a part of the Mahatma Gandhi Series. The Reserve Bank introduced the ₹20 note in the Mahatma Gandhi Series in August 2001. Making it one of the last denominations of the series to be introduced in the series; other than the ₹5, which was introduced in November 2001. The Indian 10-rupee banknote is a common denomination of the Indian rupee. The ₹10 note was one of the first notes introduced by the Reserve Bank of India as a part of the Mahatma Gandhi Series in 1996. These notes are presently in circulation along with the Mahatma Gandhi New Series which were introduced in January 2018, this is used alongside with 10 rupee coin. The Indian 2000-rupee banknote (₹2000) is a denomination of the Indian rupee. It was released by the Reserve Bank of India (RBI) on 8 November 2016 after the demonetisation of ₹500 and ₹1000 banknotes and has been in circulation since 10 November 2016. It is a part of the Mahatma Gandhi New Series of banknotes with a completely new design. The Indian 10-rupee coin is a denomination of the Indian rupee. The ₹10 coin is the highest-denomination coin minted in India since its introduction in 2005. The present ₹10 coin in circulation is from the 2011 design. However, the previous ₹10 coins minted before 2011 are also legal tender in India. All ₹10 coins containing with and without the rupee currency sign are legal tender, as stated by the Reserve Bank of India. Along with the standard designs, there are 21 different designs for this denomination and are minted as circulating commemorative coins, this is used alongside the 10 rupee banknote. The Indian 200-rupee note (₹200) is a denomination of the Indian rupee. Post 2016 Indian banknote demonetisation, the new currency notes have been announced by the Reserve Bank of India-- ₹2,000, ₹500, ₹200, ₹100, ₹50, ₹20 and ₹10. ↑ "Cabinet approves new rupee symbol". Times of India. 15 July 2010. Retrieved 15 July 2010. ↑ "India seeks global symbol for rupee". Hindustan Times . 6 March 2009. Retrieved 7 March 2009. ↑ "Cabinet defers decision on rupee symbol". Sify Finance. 24 June 2010. Retrieved 10 July 2010. 1 2 "List of Five Entries which have been selected for Final". Ministry of Finance, Govt of India. Archived from the original on 11 July 2010. Retrieved 15 July 2010. ↑ "Rupee: Which of the 5 final designs do you like?". Rediff Business. 16 June 2010. Retrieved 26 July 2010. ↑ "Rupee to get a symbol today!". Money Control.com. 26 February 2010. Retrieved 10 July 2010. ↑ "Cabinet defers decision on rupee symbol". PTI. 24 June 2010. Retrieved 10 July 2010. 1 2 "Cabinet approves new rupee symbol". Times of India. 15 July 2010. Retrieved 15 July 2010. ↑ "Department of design/ faculty". Iitg.ernet.in. ↑ "Indian Rupee Joins Elite Currency Club". Theworldreporter.com. 17 July 2010. 1 2 "Currency Symbol for Indian Rupee" (PDF). Idc.iitb.ac.in. Retrieved 14 November 2018. ↑ approval by Ministry of finance. Approval of Indian Rupee symbol (PDF). Retrieved 1 August 2015. 1 2 Nair, Harish V (23 November 2010). "'Rs' selection process challenged in High Cout[sic]". Hindustan Times . Archived from the original on 24 November 2010. Retrieved 25 November 2010. ↑ "W.P. (C) No. 7915 of 2010 & CMs 20440-41/2010". Scribd. Retrieved 28 February 2011. ↑ "Issue of new series of Coins". RBI. Retrieved 4 November 2011. ↑ "This numismatist lays hands on coins with Rupee symbol". Times of India. 29 August 2011. Retrieved 4 November 2011. ↑ "Issue of ₹10 Banknotes with incorporation of Rupee symbol". RBI. Retrieved 23 January 2012. ↑ "Issue of ₹ 500 Banknotes with incorporation of Rupee symbol". RBI. Retrieved 23 January 2012. ↑ "Issue of ₹ 1000 Banknotes with incorporation of Rupee symbol". RBI. Retrieved 23 January 2012. ↑ "Issue of ₹ 100 Banknotes with incorporation of Rupee symbol". RBI. Retrieved 23 January 2012. ↑ "RBI to issue Rs 20 and Rs 50 notes with the new rupee symbol". Economic Times. 12 April 2012. Retrieved 30 April 2012. ↑ Michael Everson (19 July 2010). "Proposal to encode the INDIAN RUPEE SIGN in the UCS" (PDF). Retrieved 30 July 2010. ↑ "Unicode Currency Chart" (PDF). Unicode.org. ↑ "U+20B9: Rupee gets Unicode identity". Livemint.com. ↑ "The Ubuntu Font, now with added Rupee - blogs.kde.org". Blogs.kde.org. ↑ Canonical. "Ubuntu font". Font.ubuntu.com. ↑ Agrawal, Rajat (27 June 2013). "iOS 7 brings India specific English keyboard". BGR India. Wikimedia Commons has media related to Indian rupee sign .